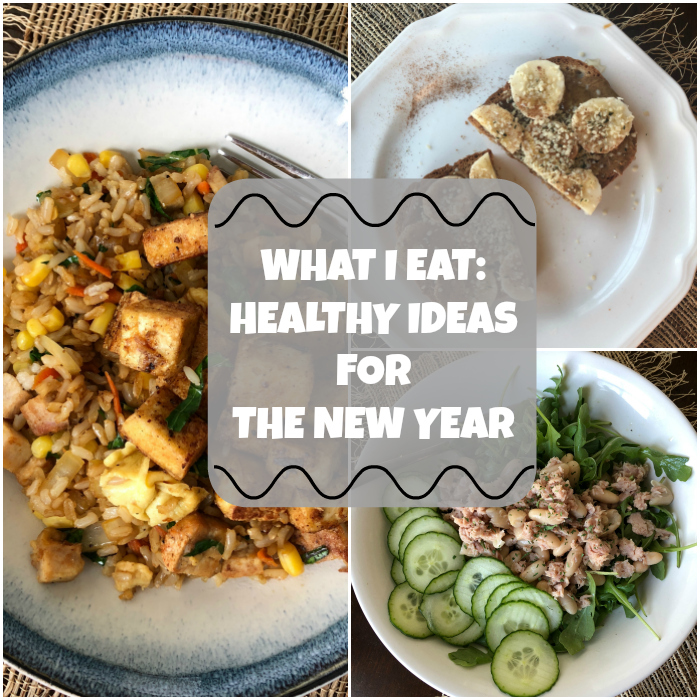 It’s time to get healthy for the New Year! Or, in my case, just get back on track after some holiday indulging. Here’s a glimpse into how I’m doing just that! Guys! It’s 2018. Where the heck did 2017 go?! Normally I’m really sad to see the holiday season go, but this year I embraced it. It’s nice to have my house back in order and have some extra time to get organized for the year. I’m sure we all indulged a little too much over the holiday season. I try to keep myself on track as much as possible, but the last two weeks are always killer! Between all the cookies and yummy snacks (like, dips… lots of dips), I’m in need of a detox. <– I hate that word, by the way. In case you’re wondering, you can’t really “detox” your body by drinking some magic juice, or eating certain foods. We have a liver and kidneys to do that for us! Now that I got off on that tangent (brought on by my misuse of the word detox), let’s say I need a reset instead of a detox. ? So, what does one eat when they need a reset? Well, I’m glad you asked dear friends because I’m going to share that with you. 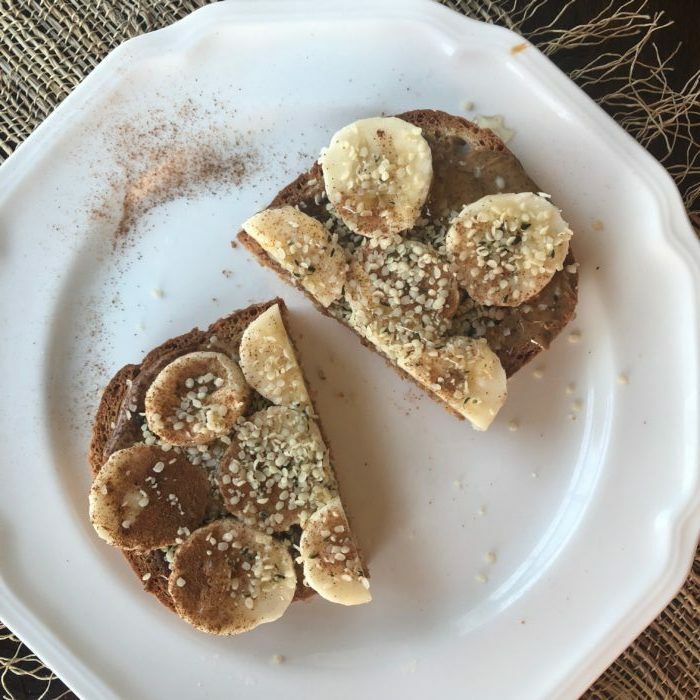 Whole-grain gluten-free toast topped with almond butter, banana slices, cinnamon, hemp seeds, and drizzled with a little honey. SO delicious and satisfying, but doesn’t weigh you down. This keeps me full throughout the entire morning. 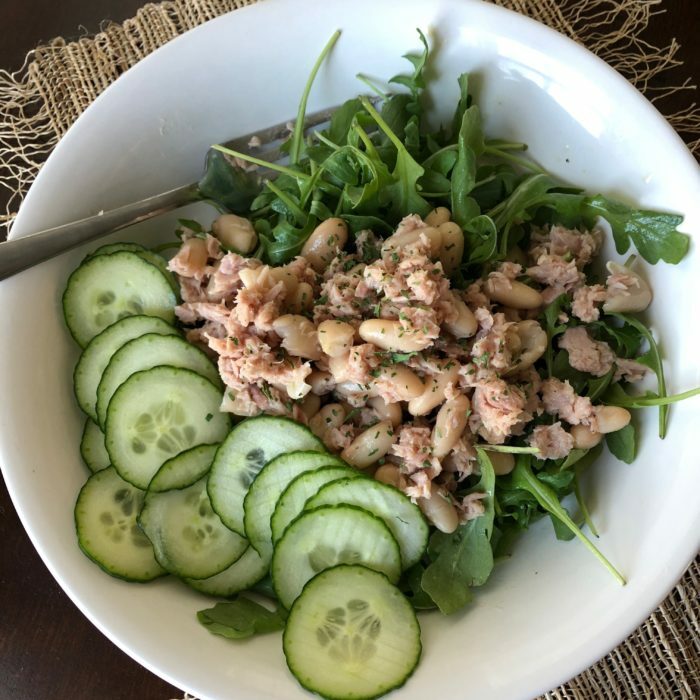 Arugula topped with tuna, white beans, cucumbers, and a quick lemon vinaigrette. Shake it all up in a mason jar, and drizzle it on your salad. 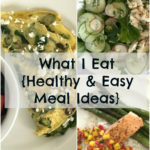 Easy and delish! Clean-out-the-fridge fried rice. I had leftover brown rice and pork hanging in the fridge so I whipped up this tasty fried rice! I topped with crispy tofu for even more protein and because I looooove crispy tofu. Heat a large skillet or wok over high heat and drizzle lightly with oil. Cook the egg until set and scrambled and remove it to a dish. Drizzle the pan with more oil if needed and add in the pork. Cook the pork pieces until golden brown and crisp. Set aside. Cook the onion, carrot, and kale for a few minutes or until soft. Add the veggies to your reserved eggs and pork. Drizzle the pan with more oil and in the brown rice. Stir-fry the rice until it starts to turn golden and then add in all of the ingredients you set aside and toss to combine. Stir in the corn and add soy sauce and black pepper to taste. 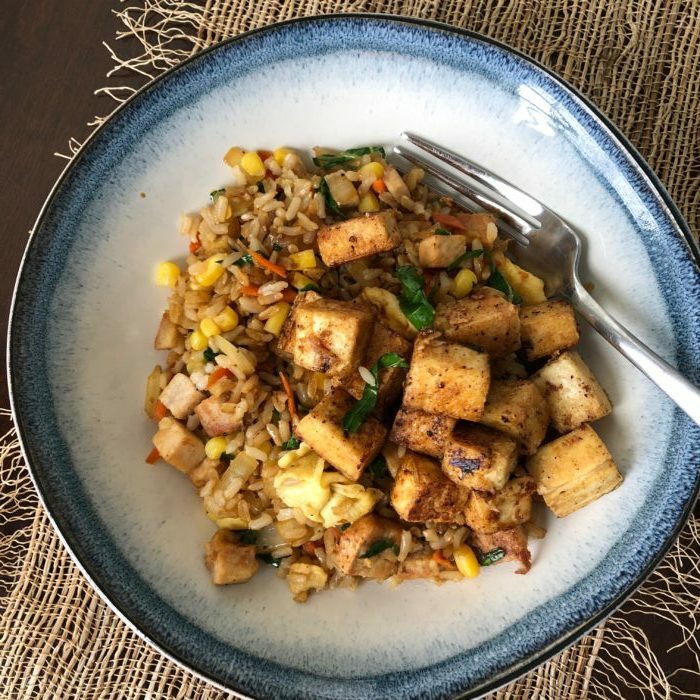 If you want to top with crispy tofu, just cut and press your tofu between paper towels and once it’s dry just toss with some cornstarch and season with salt and pepper. 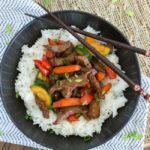 Crisp it up in a non-stick skillet and top your rice with it! It all sounds more complicated than it is, but I promise it’s easy. Just make sure you prep all of your ingredients ahead of time and you’ll be good to go! Have a great weekend and I’ll see you back here on Tuesday for the first recipe of the New Year! Stay warm, friends. ✌? I haven’t tried that, but I need to! I love sweet potatoes. Thank you for the suggestion, Britt! Hello, this is so helpful this year. I have been eating sweets this holiday season. I went home and mom will always prepare cakes and others. Gosh, I am getting fat. 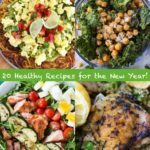 I need these healthy food ideas this new year. Thanks for this. Xoxo.